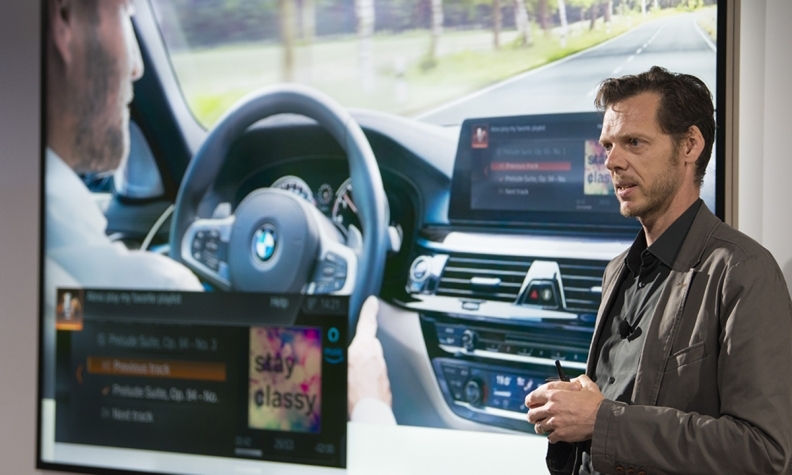 Thom Brenner, vice president of connected car services at BMW, speaks during an Amazon product reveal in Seattle in 2017. Amazon is embracing open-source software in the race to get its voice-based Alexa digital assistant into cars ahead of Google. Amazon engineers are working with Nuance Communications and Voicebox Technologies to write code that makes in-vehicle apps compatible with several speech-recognition technologies, eliminating the need for developers to make multiple versions. A working group was set up about a month ago and is meeting once a week, with the aim of having the software ready by June. The catch is that the cars must use Automotive Grade Linux, an open-source platform being developed by Toyota Motor and other auto manufacturers and suppliers to underpin all software running in the vehicle. The only cars currently on the system are Toyota's new Camry and Sienna and the Japanese version of the plug-in Prius, though the áutomaker plans to expand that list. AGL has been growing too, reaching 114 members currently, up from around 90 a year earlier. Amazon signed on last month. "With Alexa integrated into AGL, the process of building voice experiences is dramatically simplified for developers," John Scumniotales, director of products at Amazon Alexa Automotive, said by email. "This would ultimately speed the rollout of voice services into cars. AGL has an opportunity to scale voice experiences across the automotive industry." Amazon's goal is to keep people connected seamlessly to Alexa between their homes and cars as it goes head-to-head with Google Assistant. The battle was on display at the CES technology expo in Las Vegas last month, when the Alphabet unit plastered billboards with "Hey Google" ads and announced its assistant will be available for all cars that run its Android Auto software. Amazon countered with an agreement to put Alexa in Toyota cars, adding to similar deals with Ford Motor and BMW. People spend a lot of time in their cars, so becoming the dominant system in vehicles is important in the race to become the leading voice-assistant provider, said Jitendra Waral, a San Francisco-based technology analyst at Bloomberg Intelligence. "Both Google and Amazon have announced partnerships, but it's very early to tell."